Is yet another great day with a great result by the Indigenous People Of Biafra (IPOB) led by Mazi Nnamdi Kanu the Director of Radio Biafra / Biafra TV at the useless summit led by this current traitor and a Fulani puppet Nnia Nwodo of Ohanaeze Ndi-Igbo President who was bundled out of Ekwueme Square Awka by our formidable Biafran mothers who refused him from delivering his deceitful speech on restructuring despite the tensions and moves by his pay masters using the terrorist Fulani Jihadist armed forces of Nigeria to install and hold back this fearless generations of Biafra making it to the venue of the useless summit. The formidable lions of Biafrans today the 21st May 2018 won at last as always. 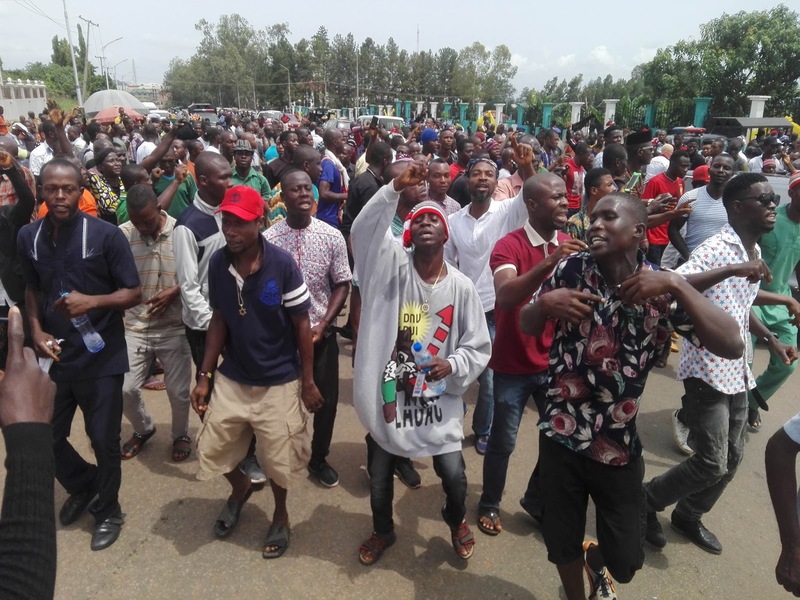 Although the victory was without some minor obstacles which couldn't hinder or hold back this zealous Biafrans from demanding that this useless Ohanaeze apex group should rather support Biafra Referendum over this useless Restructuring garbage of a failed state of Nigeria. They must understand that this there useless restructuring garbage is dead on arrival. I think they should go back to history and ask on what happened to the Aburi Accord led by Late Dim Ojukwu the Biafran general which Gowon tore and went to war with the Indigenous people? They shouldn't fail to go back to history. Restructuring is dead at arrival. 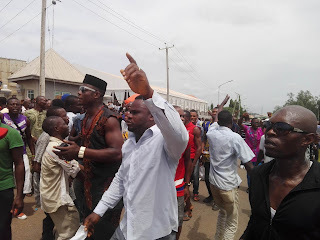 On the arrival of the restructuring summit at Alex Ekwueme Square Awka Province of Biafra land, countless numbers of Biafrans were apprehended by DSS agents who searched with intimidation at every sight of vehicles coming to Awka Province of Biafra land in bid to apprehend any Biafran with Biafra material. DSS operatives demanded that Biafrans should present their Nigeria ID Card before they could be allowed to enter Awka town. But the good news was, that the formidable lions of Biafran reinstated that they don't have any Nigeria ID on them because they are Biafrans and have the full right to navigate any Biafra province or town in Biafra land. 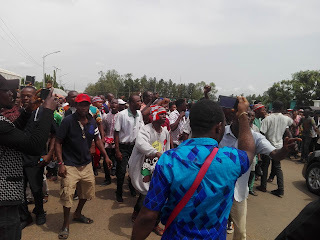 Another traitor was spotted at the entrance of Ekwueme Square in Akwa with the name Rita Anagbogu of the Movement Of Biafrans In Nigeria (MOBIN) who was with Nigeria Police officers identifying IPOB members for the members of the NPF to arrest and intimidate them. Indeed, that's an act of sabotage of the highest level. Enough is enough for this traitor for these criminals parading themselves as Biafrans. Numbers of Biafrans on attendance of the summit were picked and taken to an unknown location by the members of the DSS agents and police officers she led. This height of sabotage will never be taken slightly or for granted. However, a Biafran journalist by name Moses Agbo of Family Writers Press (FWP) among some other Biafrans who were brutalized by the Nigeria Police force, sustained injuries on the head (as they covered the event live) from the brutality of the men of Nigeria Armed forces ordered by this criminal traitor Nnia Nwodo to harass and possibly kill Biafrans who would attend his deceitful summit. He is in stable condition and will continue with orders to expose Nigeria and restore Biafra at the end. Also, another event that took place today was the jungle justice of the federal high court Abuja. The scheduled court hearing of the bail application of Mazi Nnamdi Kanu co-defendant today the 21st May 2018 at the Federal High Court (FHC) Abuja was postponed and adjourned to 31st May 2018 for no tangible reason attached to it. Indeed, Nigeria is a crime against humanity. This crime against humanity called Nigeria has no respect for the rule of law. Nigeria must be dissolved immediately because is a crime against humanity. The Ohanaeze Ndi-Igbo don't organize a summit to discuss restructuring on behalf of the people without the people's consent and approval. The three (3) arms of government of Nigeria is indeed a threat to humanity and must be dissolved and also dismantled in time before they wreck more havoc on the peaceful people of Biafra. Actually these 3 arms of government have been hijacked by terrorists and terror is all that awaits Biafrans and the gullible Nigerians. Dissolve Nigeria now because is a crime against humanity. Self-determination is not a crime but the fundamental human rights of the indigenous people. Biafra must be free.